Classic Quilt Blocks - no templates, please! 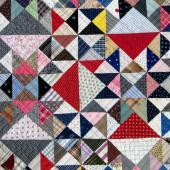 Classic quilt blocks consist mostly of squares and triangles. So much geometry mustn't be boring however. This class teaches you how to sew most of these blocks without the help of templates - it will be just you and your rotary cutter. The class is held in German, but we will do our utmost to accomodate you if you don't speak German. Please contact us BEFORE enrolling. This pattern which is known under different names and is based on a "cut-sew-cut-sew" process, has lately gone a little out of fashion in the quilters' scene. Which it doesn't deserve at all in our opinion. It is a very versatile pattern, a lot easier to sew than it looks like and giving a wonderful impression of dynamics on any quilt, cushion or placemat. With so much colour throughout the quilt, and a pieced border "melting" into the main pattern, it was clear that this quilt would need a narrow, solid binding in a bright and daring colour. We discarded black as too sombre right away and white for being too tame. Moreover, both colours couldn't really be called "bright", could they?